The world’s highly successful doughnut and coffee shop-- Krispy Kreme, recently opened its 1000th store in Kansas City last February 24! From the company's humble beginnings in 1937 where they have opened their first store in North Carolina, Krispy Kreme indeed has grown into the doughnut empire that they are now with numerous branches in 23 countries across the globe. 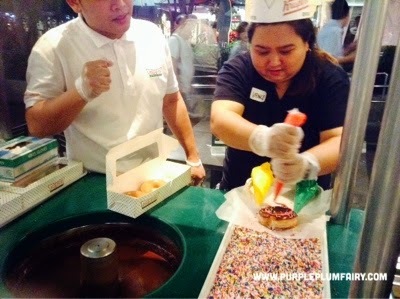 It was first brought to the Philippine shore in 2006 and since then, Krispy Kreme fans just couldn't get enough of their original glazed along with their classic brewed coffee. In celebration of Krispy Kreme's 1000th branch, we were welcomed at the Krispy Kreme The Fort by Krispy Kreme Philippines President and CEO Ms. Sharon Fuentebella along with Krispy Kreme Assistant Marketing Manager Ms. Ariane Valinton. 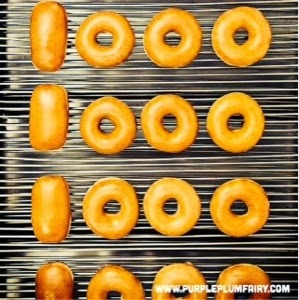 On that same morning, 36 participating Krispy Kreme stores nationwide also gave away our favorite 1000 free original glazed doughnuts to celebrate such monumental achievement. 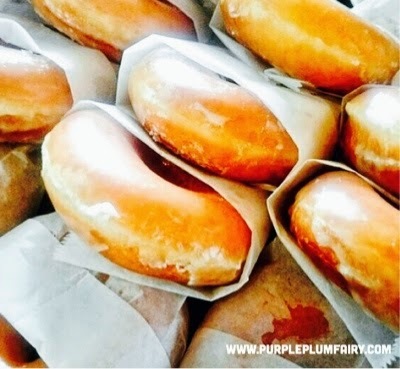 Imagine giving away 36,000 of their mouthwatering original glazed doughtnuts in a day? Whoa! Our friends at Krispy Kreme are indeed generous. What a way to thank loyal Krispy Kreme fans! 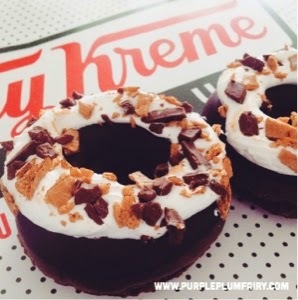 Krispy Kreme also gave us the chance to sample their latest flavors: Salted Chocolate and S'mores. I've had them along with my all-time super favorite Coffee Jelly drink. 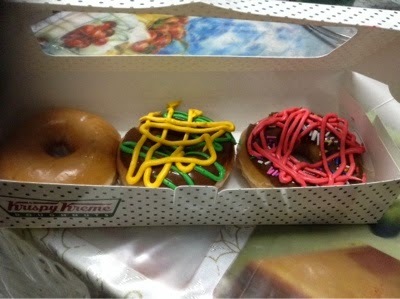 They had also given us the chance to decorate our very own Krispy Kreme doughnuts at the Krispy Kreme booth. It's really fun and easy to do. 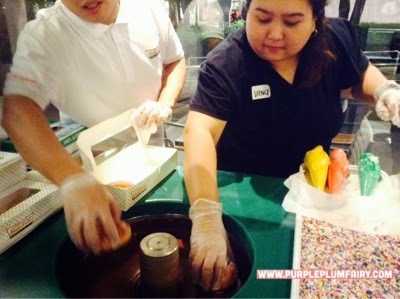 You just have to dunk the half of the original glazed doughnut into the swirling warm chocolate mixture, then while it's still warm, make sure to put some candy sprinkles or you could also pipe-in some colorful icing mixtures to be able to personalized your doughnut. 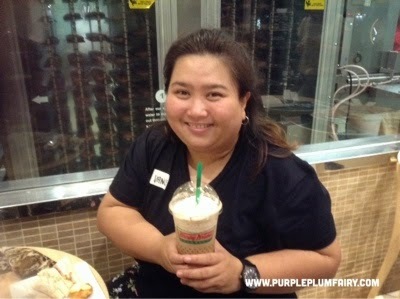 Your Purple Plum Fairy enjoys her cup of Coffee Jelly. 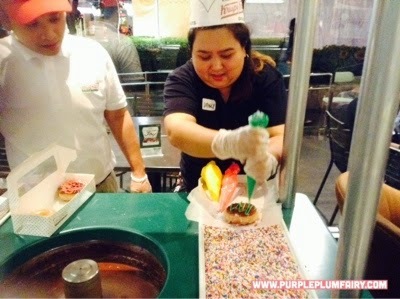 Purple Plum Fairy tries her hand in Krispy Kreme's decorate your own doughnut. These are my creations that will surely satiate anyone with a sweeth tooth. 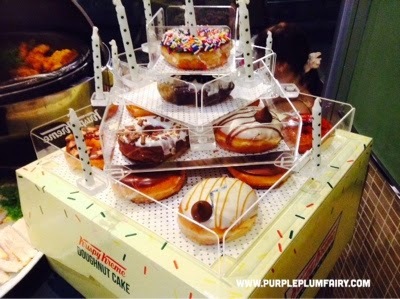 And get this: Make your party to be truly unforgettable with Krispy Kreme's Doughnut Tower Cake! An all original glazed tower for only Php1,429 and an assorted doughnut tower for Php1,550 which you can share with your friends. 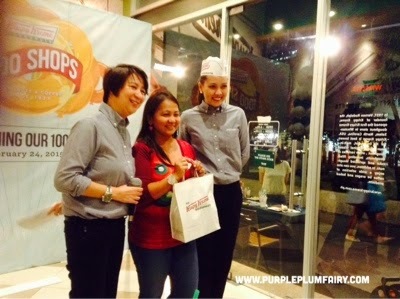 Krispy Kreme President and CEO Ms. Sharon Fuentebella, Instagram contest blogger winner Jing Javier and Krispy Kreme's Assistant Marketing Manager Ms. Arianne Valinton. 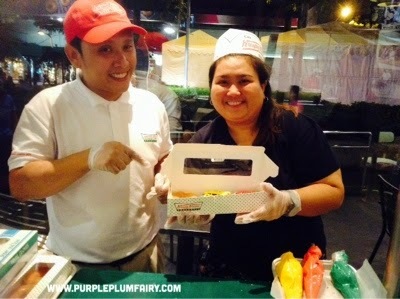 Thank you so much Krispy Kreme for all the fun we've had at your the Fort Bonifacio Global City branch. Thanks for the six original glazed doughnuts inside a reusable Krispy Kreme Tin Can, our very own designed doughnuts + a lovely Krispy Kreme T-Shirt souvenir! 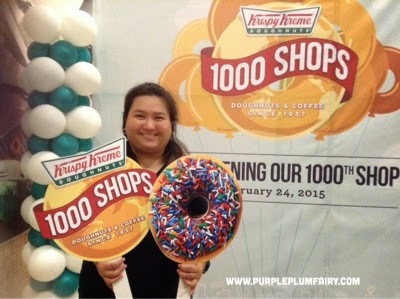 Congratulations to Krispy Kreme and More Power! 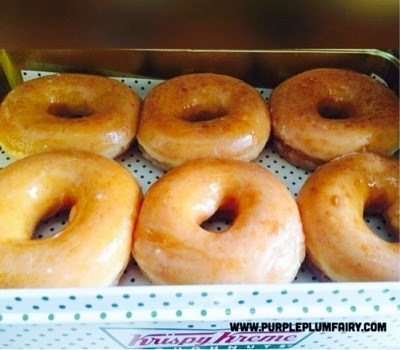 Warm and freshly baked Krispy Kreme original glazed doughnuts!